above) the only one human beings can possibly have, which is induction. logical insight and a material hypothesis? no heed to past and present non-occurrences of error (in the domain under consideration). That is, it is itself a theory, open to inductive evaluation like any other. evidence in favor of X rather than all other alternatives. has a theory that is closer than closest! rightly complained that this could not possibly be regarded as logically final and binding! to seem flawed to us. attacked human knowledge in general, whining that it cannot be “proved”. supposedly flawless proposition. One cannot reasonably have one’s cake and eat it too. The argument against generalization is itself a generalization, and so self-contradictory. that one) that leads to a contradiction is deductively invalid. 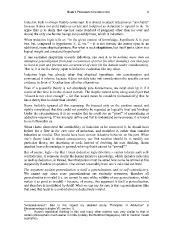 Phenomenology (chapter VII, section 1).